What grade level should I choose for my child? The class my child wants is full. What do I do? What if our summer plans change and I need to withdraw my child? What are the hours of the Lexplorations program? I need to drop my child off earlier than 9:00 am and pick-up later than 3:00 pm, what can I do? I only need the Before-School and After-School Program on Tuesdays and Thursdays. Can I sign up for just two days? What should my child bring to Lexplorations? Who do I contact if there is a change in my child’s dismissal plan? Grade level refers to the grade your child will be entering in Fall of 2019. If paying online, confirmations of registration are emailed upon registration. If paying by check, confirmations will be mailed in June. We suggest you register your child in a second choice class for that week and indicate your child’s first choice. We will place your child on a waitlist for their first choice class and contact you if a spot becomes available. You will not be charged a switch fee if your child moves to their first choice class. If you contact Lexplorations at least 10 days prior to the start date of your child’s class, tuition will be refunded minus a processing fee of $30 per class. If you withdraw your child with less than 10 days prior to the start date of your child’s class, all tuition will be forfeited. You can switch your child to another program for a $15 switch fee by contacting the office. Most Lexplorations programs meet from 9:00-3:00 pm unless otherwise noted. 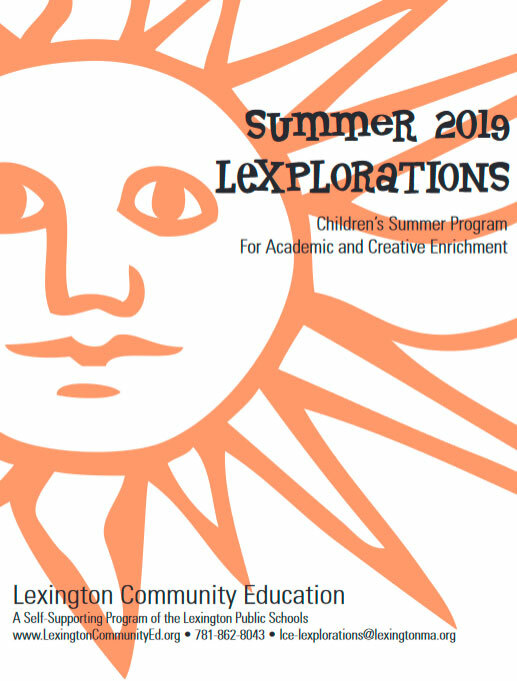 Lexplorations offers both a Before-School Drop-Off Program from 8:00-9:00 am, and an After-School-Care program from 3:00-6:00 pm at the Estabrook School. Students must be enrolled in a Lexplorations program to participate in either of these programs. Please note the programs are available ONLY at the Estabrook School. LCE does not provide transportation between Estabrook and other locations. The only registration option for either the Before and After-School programs are by week. There is no option to only sign up for selected days. Lexplorations does not supply lunch or snacks. Please pack a daily snack, drinks, and lunch for your child. There are no refrigerators in the classrooms. Please pack an ice pack if necessary. If your child is entering Kindergarten, 1st or 2nd grade we recommend that you pack an extra T-shirt, underwear, and shorts/pants. Please do not send your children to Lexplorations in flip flops. Ideally the students will wear sandals with straps, or sneakers. Please contact the Lexplorations office at 781.862.8043 to report absences. Please do not call the Estabrook or Lexington High School office. Estabrook and Lexington High School staff do not administer the Lexplorations program and cannot help you. If there is a change in your child’s dismissal arrangement (going home with a friend, will not be attending after-school, etc.) please contact the LCE/Lexplorations office at lce-lexplorations@lexingtonma.org Please note, we cannot guarantee that change requests received with less than two hours notice will be processed. Children should be able to participate in group activities with teacher supervision. If a child is unable to do so, we will contact parents immediately to discuss the appropriate next steps. We expect students in our programs to follow their teacher’s instructions and treat each other and staff with respect. If your child does not meet these expectations, we will bring this to your attention. If your child’s behavior continues to be inappropriate, you will receive a call from our staff and be asked to remove your child from the program for the day. If after that there is still no change, we will ask you to withdraw your child from the class and no refund will be given. We have a zero-tolerance policy for inappropriate physical behavior. If a child inappropriately touches or harms others, he or she will be withdrawn with no further warnings, and no refund will be given.